Let's celebrate this month with some good news!!! 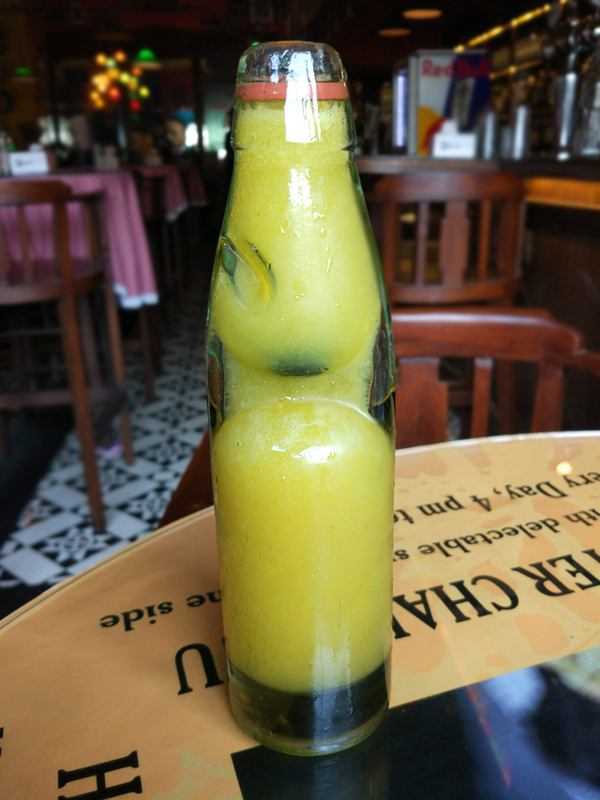 SodaBottleOpenerWala, a quintessential Bombay Irani Café with popular outposts in Bandra, Powai & Thane has turned five. 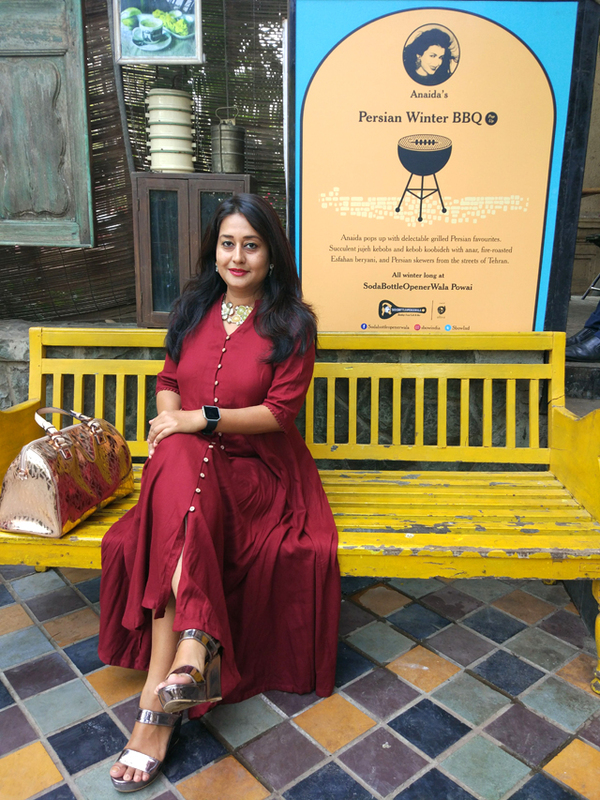 Known for its tempting Parsi fare like Berry Pulao, Parsi Mutton Masala Roast, Chicken Farcha, Bombay Street Food and Persian cuisine, the restaurant is celebrating “Soda Turns 5”, with Chef Anaida Parvaneh's Persian Winter Barbeque Pop-up at their outpost in Powai, Mumbai. Inspired from Chef Anaida's rich Persian heritage, the Winter Barbeque Pop-up celebrates the fascinating exchange of flavors, spices and style of cooking between Indian and Persian cuisines and adds a unique spin that shall be enjoyed by all. We spoke to Chef Anaida to know more about the special menu and her absolute must try dishes. Since its winter, on her list are favorites like Anaida's Magic soup, Esfahan Beryani, Veg Haleem - a great spin on the non veg version, sizzlers served with juicy kebabs and the irresistible Baklava. 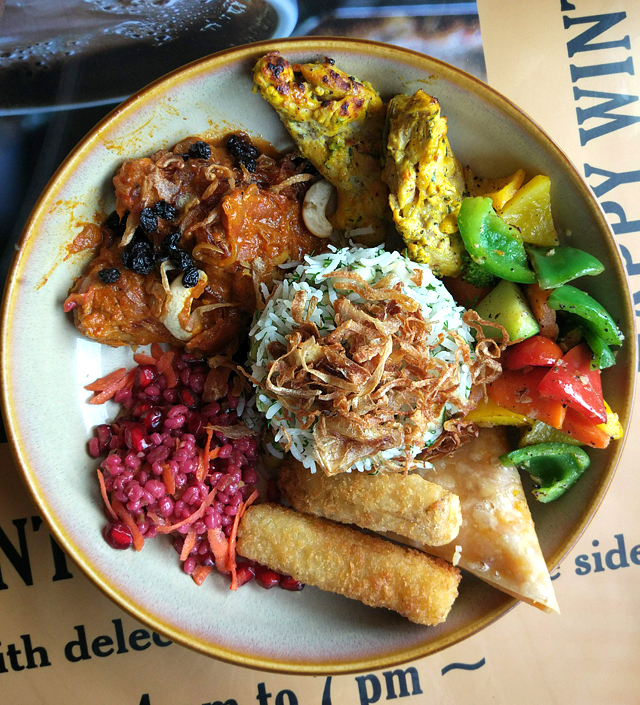 The menu also features quirky fusion dishes like Paneer Zucchini Sizzler that uses Indian paneer instead of Iranian feta cheese but retains other Iranian flavors. Persian food has lot of elements and is best eaten all together - take a bite of a grilled tomato along with saffron rice while digging into some vegetables and peanut choshni (similar to chutney) to enjoy flavorful layers. 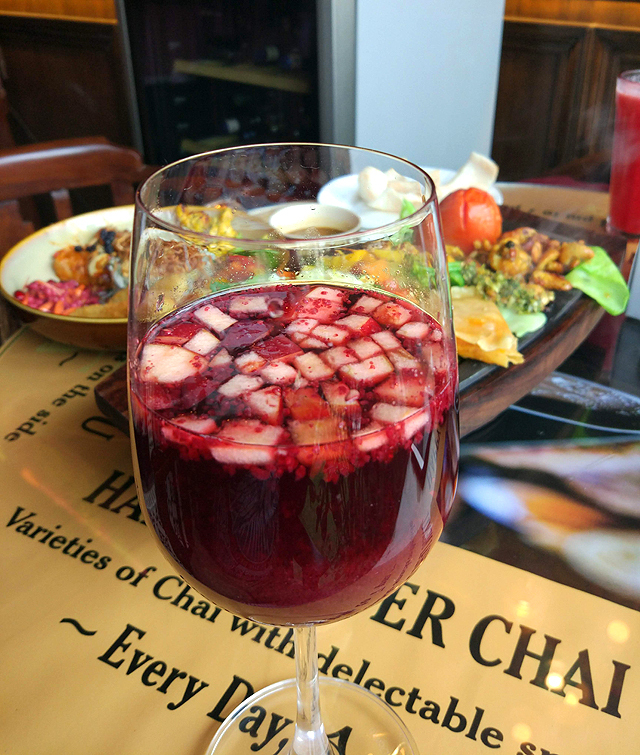 To get things started, we sipped on a delicious cocktail Bantawala - vodka spiked with raw and ripe mango flavors that came in a old soda bottle and a mocktail called Five Berry Sober Sangria - a delicious take on classic sangria with 5 types of berries. 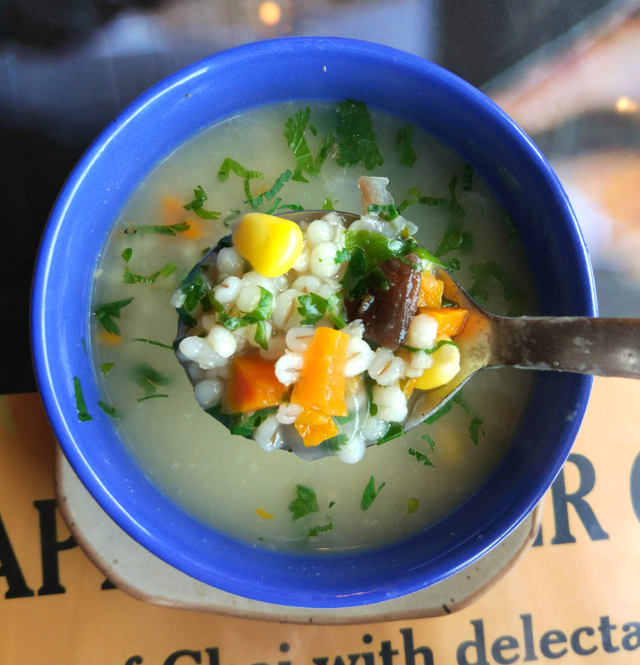 We started with Anaida's Magic soup made with mushrooms, pearl barley, mixed sprouts, turnips, carrots and some roasted vermicelli that was flavorful without the touch of too many spices and perfect to start your meal on a winter day. 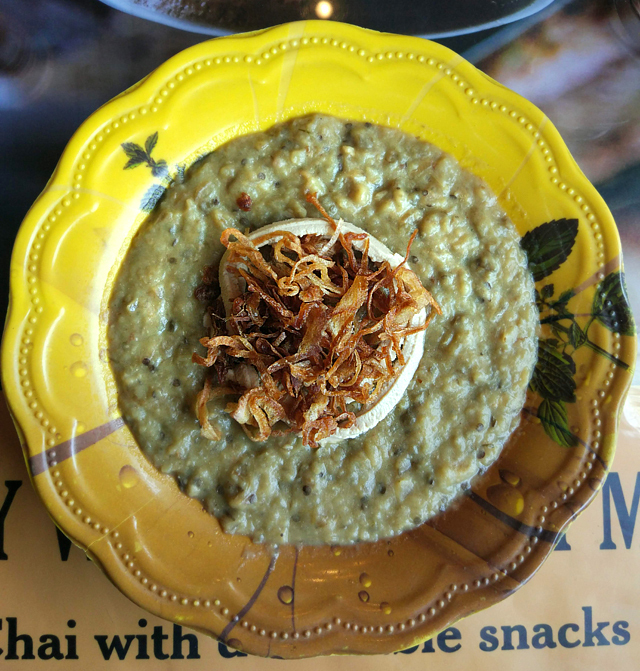 From the Chef's Specials section, we tried Veg Haleem, known as Haleem Bandenjan made with roasted eggplant, onions, Iranian kashk (whey sauce) and a hint of cinnamon powder. 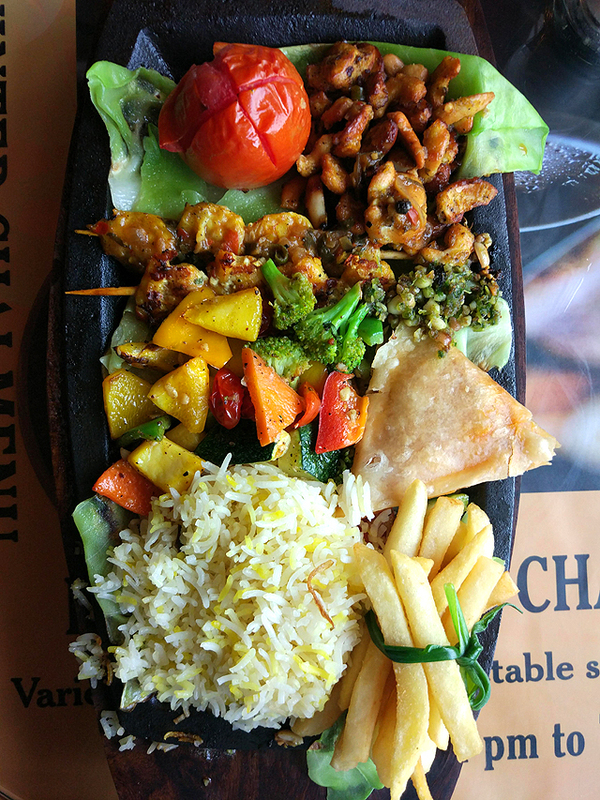 For main course we tried, Tamarind Shrimp Sizzler - barbecued shrimps flavored with tamarind cashew nut sauce on skewers served with saffron rice, sanbooseh (Iranian samosa) served along with seasonal vegetables, french fries and peanut choshni for a touch of spice. Chicken Bowl a complete meal in a bowl had Jujeh kebab (Persian kebab prepared with juicy pieces of chicken marinated in saffron & other spices), chicken pieces with Iranian berries in spiced tomato sauce, sauteed seasonal veggies, salad and potato sticks- a great way to enjoy flavors in a dish that is not extremely high on spices & heat. 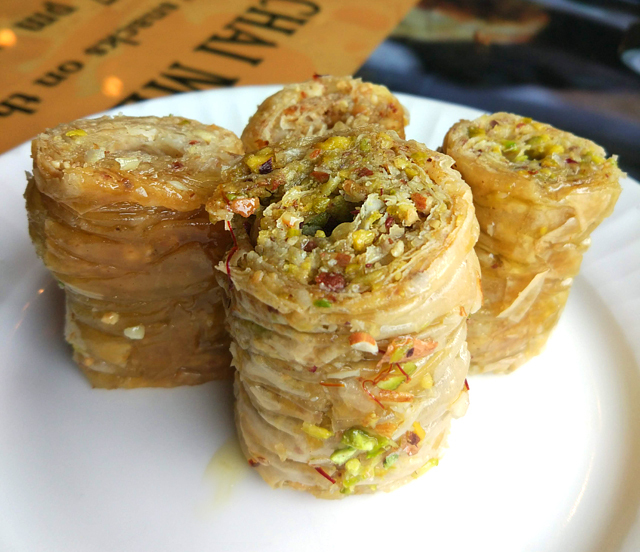 For desserts we could not resist Baklava - four pieces of nuts filled filo pastry that will quickly become a favorite from the menu. 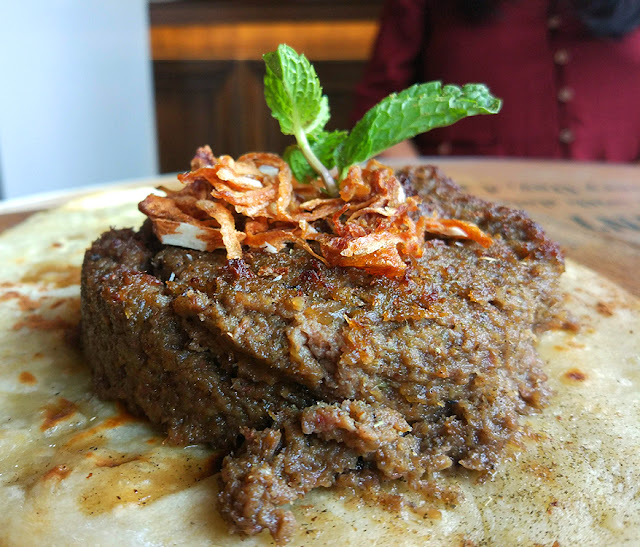 The Winter Barbeque Pop-up is a great way to enjoy non-spicy traditional Iranian delicacies from the streets of Tehran with Chef Anaida's unique twist at the much loved SodaBottleOpenerwala in Powai. Enjoy a lot of new dishes and some old favorites with strong Iranian roots and take a foodie trip down to Persia.